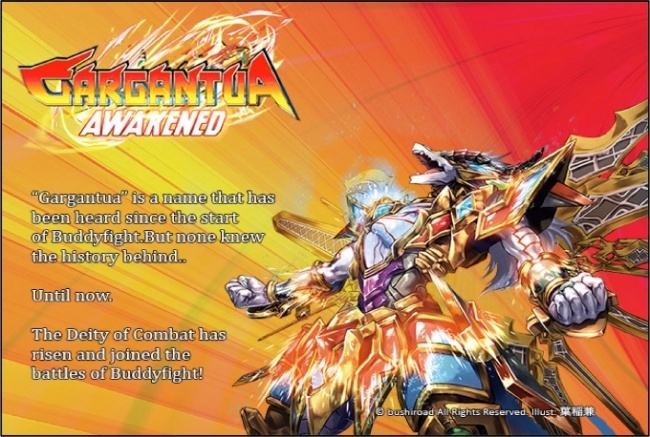 On August 3rd, Bushiroad will unleash the Gargantua Awakened booster set for its trading card game Future Card Buddyfight. This expansion set is centered around the Deity of Combat itself, Gargantua, who appears for the first time in its full glory. The set includes cards from the Dragon, Danger, Star Dragon, and Ancient Worlds, with a total of 97 different card types, with 6 reissue cards. The rarity mix for this set will be 3 BR, 4 SP, 3 AR, 15 Secret, 8 RRR, 12 RR, 12 R, 16 U, and 24 C.
Gargantua Awakened will be sold in 5-card booster packs. Each booster will include one card of R or higher rarity. The boosters are available in 30-pack display boxes, and each box will include one Secret pack and one each of the three AR cards. Some random packs will also have foil versions of common, uncommon, and rare cards.